We have had so much rain lately. Thursday was the last day of school and it doesn’t even feel like summer. I’m so over it. I am majorly missing the sunshine. I’m ready to go to the pool with the kids, go on afternoon bike rides now that school is out, and to wear shorts instead of sweaters. 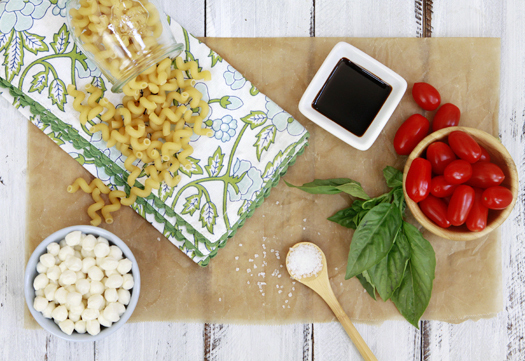 To brighten things up amidst the dark clouds and rain I thought I’d share this recipe for Easy Caprese Pasta Dinner. I make this Easy Caprese Pasta Dinner – Pasta with Tomatoes, Basil, and Mozzarella repeatedly during peak tomato and basil season. That in itself is an anomaly – the nature of food blogging is that we’re always trying new things. But I find Caprese Pasta to be a sort of Summer comfort food for us. Plus, it is a delicious dinner I don’t have to think hard about. And so year after year this Easy Caprese Pasta Dinner finds itself on the summertime menu at least a couple times a month. You’ll be using a lot of fresh basil in this recipe, so be sure to check out this awesome kitchen tip for How to Quickly Chiffonade Fresh Herbs. There really isn’t a lot to throwing this recipe together, but that tip will make it even easier. Tomatoes are one of my favorite parts of summer. I like to enjoy fresh tomatoes, grilled tomatoes, and oven roasted tomatoes. 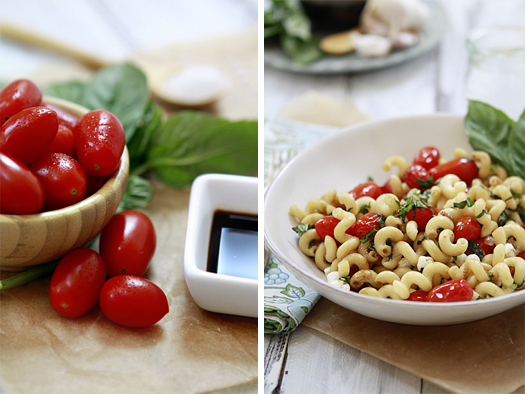 They’re perfect for snacks, salads, or lighter meals, like this Easy Caprese Pasta Dinner, when I’m not that hungry. Tomatoes so versatile and make perfect additions to healthy snacks like Tomato Corn Salsa or Deconstructed Guacamole because they are high in Vitamin C, a good source of Vitamin A, and is one of the most widely available sources of the natural antioxidant Lycopene. For more information about tomato health benefits or recipes, visit the Florida Tomato Council. What are your favorite ways to enjoy tomatoes? Cook pasta according to package instructions. Drain after cooked and set aside. Meanwhile, saute onions in olive oil until golden and tender, 5-7 minutes, over medium heat. Add garlic and saute for 2 more minutes. Stir in the tomatoes and saute until the tomatoes start to pop. Stir in the balsamic vinegar and pasta. Salt and pepper to taste. Turn heat to low. Add the basil. Cook for 1-2 minutes so the juices can coat the pasta. Remove the pan from the heat off and stir in the mozzarella and . You want to warm the mozzarella, but do not melt it. Serve immediately. This post is sponsored by the Florida Tomato Council. All opinions are my own.